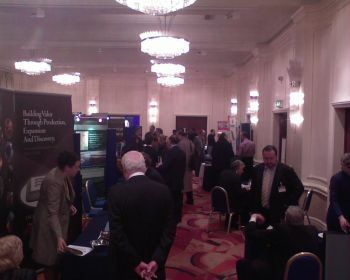 Yesterday we had the pleasure of attending The Silver Investment Summit in London, UK at the Paddington Hilton Hotel. 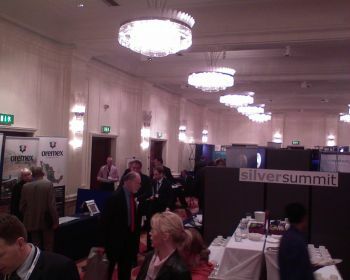 Exhibiting companies included Endeavour Silver Corp, which is in our silver stocks portfolio and has been for some time. Recently, on August 31st we described Endeavour as a silly season buy and said, “At $3.25 this stock is definitely a steal.” We are pleased to see Endeavour making a great rally back up to close at $5.16 yesterday, up 58% since August 31st prices. There was also a new German fund at the conference called Silver Capital AG. We spoke with the management teams of many companies and we will publish coverage of the companies at the conference in due course, as each company appeared to us to have a unique angle on silver mining and production. 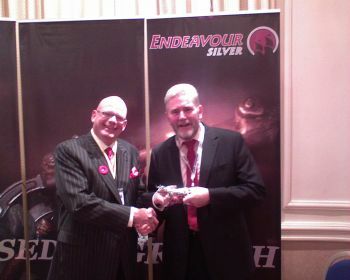 Below is a picture of Hugh Clark of Endeavour Silver having a chat with Bob; Sam was looking for re-fill at the time! It was certainly a good day for a silver investment conference with silver making incredible gains yesterday, putting on nearly a $1.00 to $15.50 and continuing this great run to its currently level of $16.11! Gold prices were also doing very well yesterday and are continuing perform superbly, with gold trading for $844.50 at this moment. It looks like we could hit an all time nominal high in gold today, but there is resistance at $850 spot and so should gold fail to break this level, it may well correct and take silver with it. We would view this as a great buying opportunity and will inform subscribers of The Silver Prices Newsletter of any opportunities we see in the market.